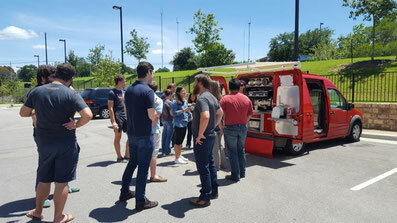 People love when the Coffee Truck shows up! The coffee truck listing information and pictures of the actual espresso truck for sale is on the 2nd and 3rd pages of this site, check out the PICTURES or the DESCRIPTION pages for more info and continue to read below! Food trucks are a great springboard into bigger things or just as a fun way to become self employed! You will find that your customers love it so much that they simply want more! 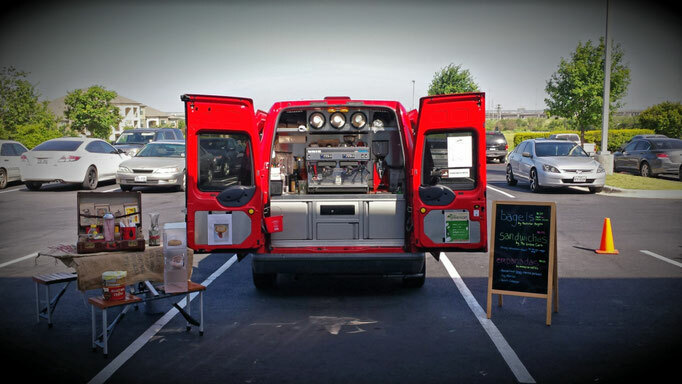 A barista running on these trucks can produce drinks more quickly than many baristas in a brick and mortar coffee shop simply because the layout is so well thought out and ergonomic. Be ready to sell soon after you arrive on location while all the other vendors are still setting up! We have been running our mobile coffee business with these trucks for over 3 years and they have been a huge hit with customers, all while the trucks themselves being astonishingly reliable. These are also a great marketing platform because by their nature; they are "out there" spreading the word about your awesome products and services. 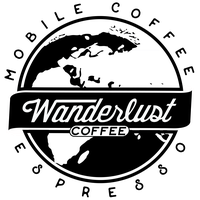 Start making a living in the coffee industry without the huge time and money investment of starting and building out a storefront. Your own mobile espresso truck is possibly the quickest way to start your dream in the coffee world! These little coffee shops on wheels are extremely efficient and agile! By using these trucks how we have made so many connections in the coffee world. We have also been able to meet contacts within commercial real estate companies who have now allowed us to move stationary cafes into their office buildings.